With a life-changing presence in Central Florida, Limbitless Solutions is motivated to influence the community through artistic and engineering advancements. Albert Manero, a University of Central Florida (UCF) mechanical engineering student, established the nonprofit organization after he received national recognition last summer for providing 6-year-old Alex Pring with a 3D-printed bionic arm. Alex was born without most of his right arm. “The Limbitless mission is to help as many people as possible. We are determined to build these 3D-printed bionic arms and provide them to children mainly,” says Nicole Bizet, a junior industrial engineering student, who is responsible for managing operations and public relations at Limbitless. In the past year, the team at Limbitless has created 12 bionic limbs for children across the country, including Michigan, Florida, and California. Locally, team members have volunteered and led presentations at local schools, including Paul J. Hagerty High School and Stenstrom Elementary School. things we focus on in our presentations is having various viewpoints and diversity in engineering and art” says Dominique Courbin, a junior mechanical engineering student, and co-founder and director of productions for Limbitless Solutions. educate them on the process of designing and printing the bionic limbs. “Sometimes we bring small printers so we can print [limbs] while we’re talking. It’s huge that they want to learn, and the kids always ask creative questions at the end” she says. Partnerships and donations are a key component to the manufacturing process at Limbitless Solutions because they provide funding and more expertise on the 3D bionic arms. “Getting other people and companies involved has been a major challenge for us,” says Bizet. biggest fans, 12-year-old Wyatt Falardeau, with a prosthetic arm themed like the show. To assist with Wyatt’s limb, they sent the organization color palettes and design details so the arm could replicate the show’s brand, says Courbin. 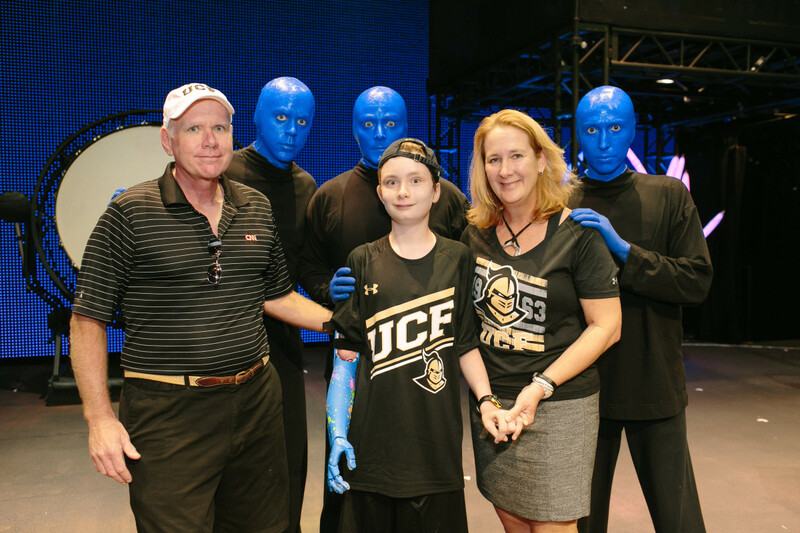 Wanting to make the moment even more special for Wyatt, the group presented him with his electric blue arm during a surprise reveal. children and to participate in more outreach programs in the community. A new UCF partnership – the development of the Center for Applied Biomedical Additive Manufacturing, or CABAM for short – will open new doors for the team. This new center, set for development at UCF’s East Orlando campus, will allow the organization to pair with the university’s research developers and will provide more space to design the limbs.